Bacon Cheeseburger Pasta - comfort food at its best! Everyone cleaned their plate!! Hamburger, bacon, hamburger seasoning, cheese soup, sour cream, cheddar cheese and diced tomatoes. Can make ahead and freeze casserole for later. Such an easy dinner recipe! After being in Europe for a few weeks, I've been immersing myself in American comfort food! There are few foods more American than cheeseburgers!!! 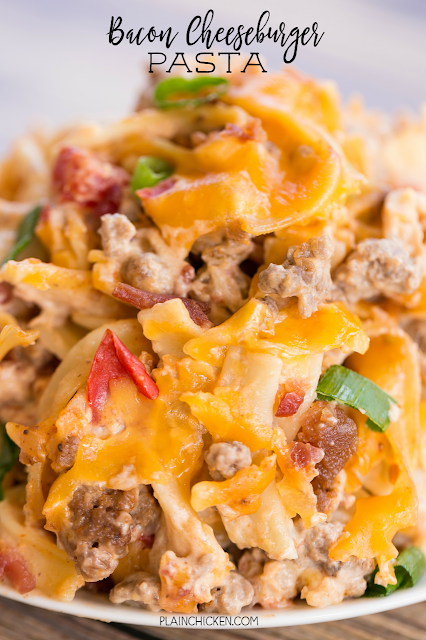 This Bacon Cheeseburger Pasta is comfort food at its best!! Seriously delicious!! Bacon, hamburger meat, cheese and noodles. YUM! 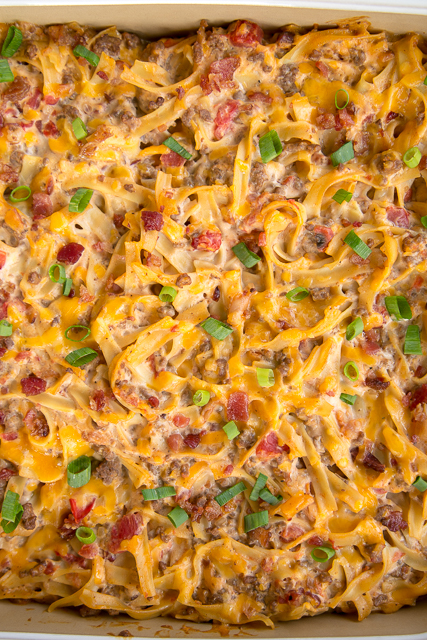 This Bacon Cheeseburger Pasta can be made ahead of time and frozen for later. I like to split the casserole between two foil pans and freeze one for later. The only special ingredient in the casserole is a package of hamburger seasoning. I used some McCormick Grill Mates burger seasoning. I got it at Walmart. It gave the hamburger meat a nice flavor. Give this casserole a try ASAP! I promise it will be a hit! I don't see pasta listed as an ingredient? The pasta is list at 12 oz. egg noodles. If freezing half should it be baked first or can it be frozen raw and baked after defrosting?? Do you think this would work with other pasta? I am not a fan of egg noodles. My family doesn't care for chunks of tomatoes, but does like tomato sauce. Do you think substituting a can of plain tomato sauce for the diced tomatoes would still work with this recipe?